LINESVILLE – With over 120 registered units and 114 involved, Linesville took the lead as the nation’s largest tractor parade on Saturday, Dec. 1 while bringing in over 4,500 people in attendance to the fifth annual event this year. (From Dec. 7 edition). According to one of the organizers of the tractor parade, Brenda Schmidt, many unique tractor setups were arranged in this year’s parade, with a few that offered multiple tractors per unit (giving them a grand total of 129 tractors featured), along with two horse units represented as well. Of this year’s most interesting features Schmidt said included a music and light show presented through several lawnmowers posing as reindeer that were pulled by a sleigh through Greenhill Farms, a float of lawn tractors symbolizing reindeer pulling Santa in his school bus sleigh by Anderson Coach and Travel, Linesville’s first ever skid steer that offered a decorated bucket that opened and closed, along with a sprayer that extended a full 15 inches in width. Additionally the parade once again included a candy combine through the parade’s other major coordinator Chad Loucks, a cat tractor through Wheeler Farms that was the first one ever to be represented in the parade, an articulated tractor through Livingston’s Packing Company, an interesting steam engine tractor through Chester Collins, a Polar Express train put together through Gary Bell, some tractors with reindeer antlers, a bucket that held a team of reindeer with a tractor as its sleigh by Troy Oskin, as well as countless other creative and innovative eye-catching tractors. For those unaware, Linesville’s tractor parade was first established by Paul and Mike Heaney from the Linesville Chamber of Commerce in 2014 and since then was taken over by Chad Loucks, with help among others such as Schmidt. In addition to the tractor parade community members also had the chance to participate in several other events that day in Linesville including Linesville’s Field of Trees, a free pedal tractor pull for kids sponsored by WTC, a cookie decorating event through Twin Pies, a free face painting through Pigments of Your Imagination, the viewing of a Christmas tree display through Mickle’s Barn, a PymaTuba Christmas concert, a spaghetti dinner through the local Presbyterian church, along with other fun holiday events. 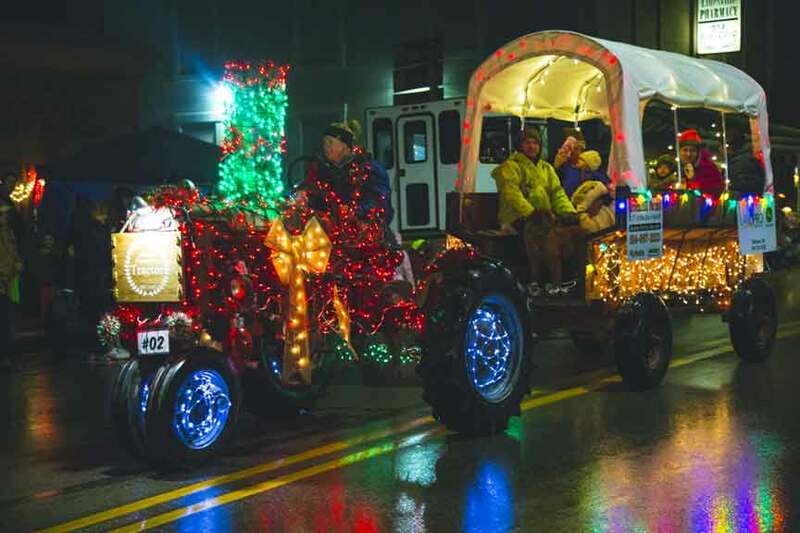 For further information about Linesville’s lighted tractor parade check them out on Facebook or visit www.linesvilletractorparade.com to find out more information about the annual event and or how to register next year for it. Pictured: Ann Meader of Loucks Farms representing sponsors WTC, Area Shopper, Greenhill Farms and Equipment, Farm and Dairy, Miller’s Free Press, Pymatuning Sportsmen's Club, and LandPro Equipment on Saturday, Dec. 1 during Linesville’s annual tractor parade.